I think it would be fair to warn you, I am somewhat obsessed with my classroom. I love the empty, bare walls at the beginning of the year, and the possibility of the language learning that is going to happen. Crazy, right? I love that I get to be creative and prepare the best environment that I can for the 90+ kids I’m going to teach each semester. Even when it’s done, I’m not done. I am constantly updating and thinking of new ways to make it more inviting, student-friendly, and language-driven (I’ll show you my new and improved art posters another day). I have this wall posted in my room and I keep it there the entire year. It has everything I need to reference to explain to anyone how and why my room runs the way it does. It also is a great reminder to the kids when I walk over to it and say “Now, which part of our contract are we breaking right now?” and they can tell me and we move forward from there. I have 4 pieces of the Classroom Contract: My Commitments, My Expectations, My Policies, and My Consequences. The agenda is not, as I used to believe, an annoyance that I have to post every day to keep admin off my back. It’s actually really important for me, my students, and anyone walking through my room. It’s a concrete way for everyone to be on the same page and to know what’s going on. I teach 4 preps this semester, and without an agenda, I would not be able to hold together everything that I have planned for each class. I also think the agenda holds me accountable to the performance objectives because when I write out the activities on the board, I can see if/how they support my daily goals, or if I’m just trying to fill time. It also helps those students who need structure to know what is coming next, even though I only write down the big rocks, not every transitional piece of the class period. For my more game-oriented students, the agenda shows the games I have planned for later as an incentive to get through my direct instruction now. The Daily Slide and Supply Station form the basis for my entrance routine. I can’t stress enough how much this has helped me with the procedural flow of my class. I create the Daily Slide, and on it, I have the date in the target language, the materials my kids are going to need, labeled in the target language, the I Can statements for the day in English (personal preference) and instructions for the Warm Up. Starting on Day 1, I train my kids to come in, look at the Daily Slide and connect the supply words on the board to the supply words at the station. They form a line, get their supplies and papers for the day and sit down to do their Warm Up. Every. Single. Day. Originally, I designated board space for my performance objectives and made boxes for them with painters tape. Every day I wrote up the I Can statements next to the Standard and tried to keep it all straight. I had multiple preps, and sometimes I would forget to write one, or they would all be squashed and small in the same box, as you see above. Not the best method, and the students surely couldn’t read them, but I was trying to do the right thing. Then, at some point, I got smart! I typed them all up, printed them, color coded them by level, and laminated them. I know it sounds like a lot of work, but once it’s done, it’s done. I used Velcro dots to stick them up to my whiteboard, but this year I use push pins, because I have a bulletin board instead. 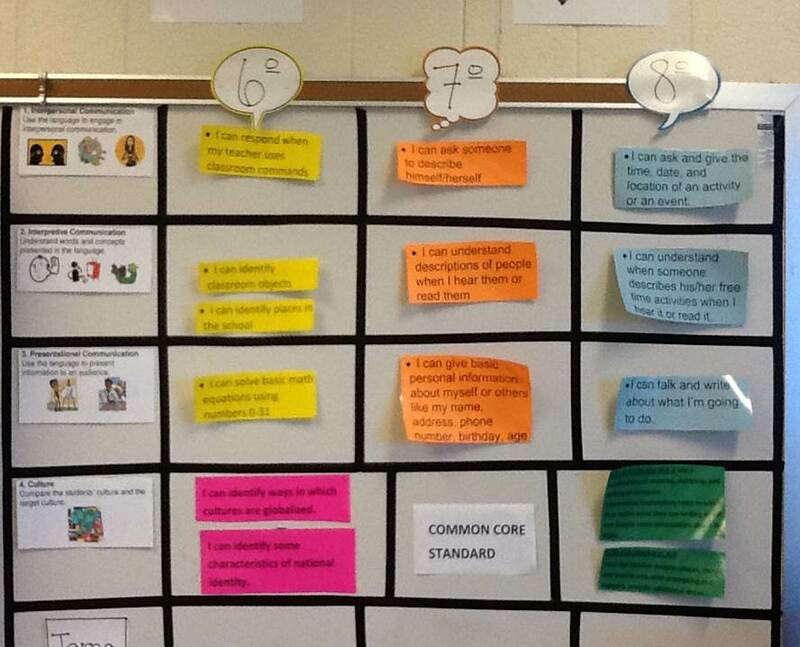 It can also be done with a hanging pocket chart in the classroom on a wall, or on one side of your cart. 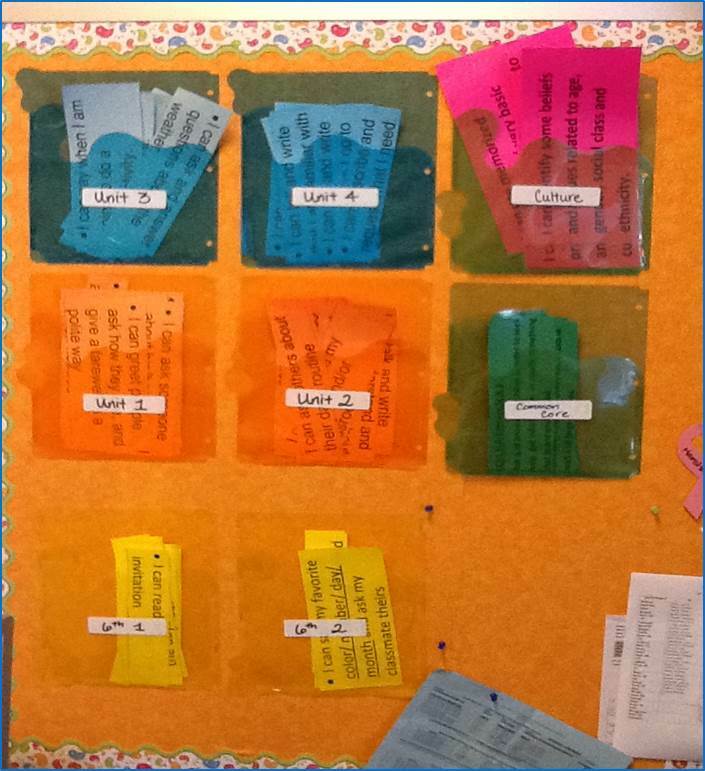 To keep them organized and easily accessible I got fancy with some plastic pocket tab dividers, and used them as folders, and stapled them to the board (an accordion file by your desk works just as well if you don’t have space). My “I-Can” statements are now manageable for each prep, big enough to be read by my kids, and I don’t lose any of them, which is a huge plus. Another staple in my room is the proficiency poster continuum which I reference every time I give them any performance task, big or small. My kids know their proficiency levels, and what that looks like in all the modes because we’ve worked with them since Day 1. The posters are in order in the front of the room where we can see them and I can reference them easily. 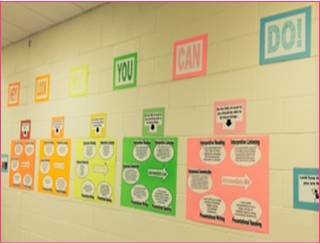 The posters help my kids own their work, and they know what it will take to “level up”. On the flip side, I can celebrate like crazy with them because I can show them examples of their work that is higher than their expected proficiency level for that particular task. Also, I made a second set and put them up in the hallway outside my room…I mean, it doesn’t hurt to educate everyone and promote my program, right? T L 90+ means that what the students see and interact with is in the target language 90% of the time. I want to supply them with as much language as possible, so I have multiple word walls. I use assorted Spanish verbs with pictures to represent them, not English words. I don’t want them to have to think about the word in English to pull the word in Spanish from their brains. I want them to see an image and associate a Spanish word. No middle man. No English translations. 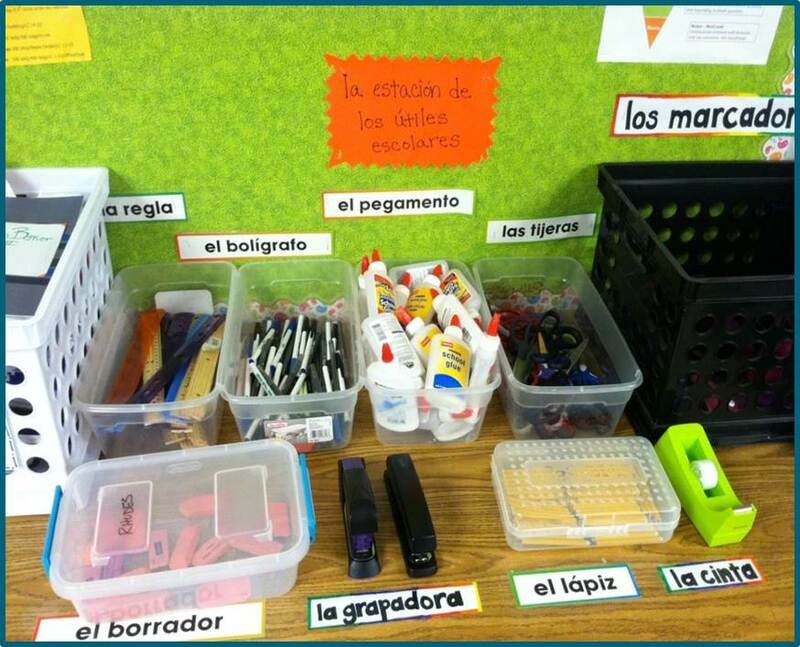 I wrote the Spanish word cards, and bought the picture cards at OfficeMax in the teacher area. I really love these because they’re all verbs. 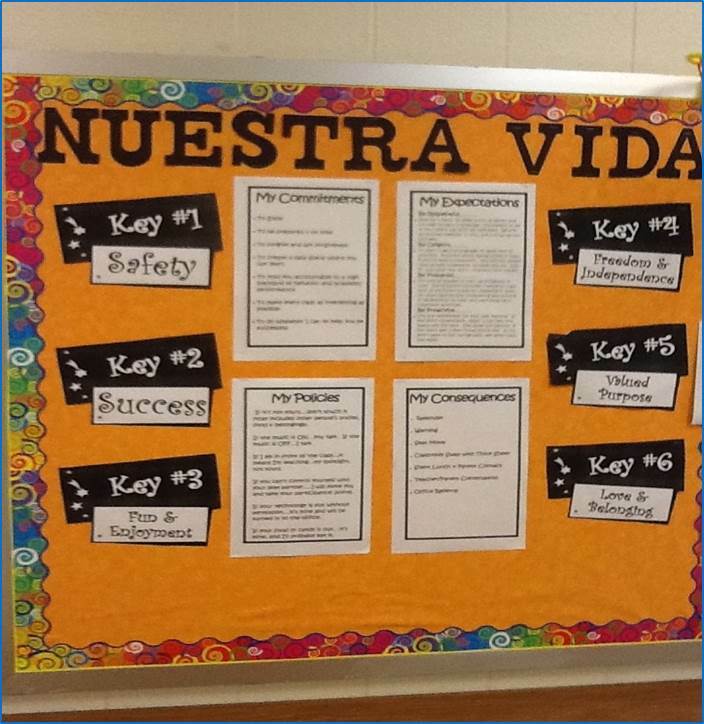 From the very beginning my students learn a few basic phrases and, using the word wall, feel empowered to speak simply on more topics. 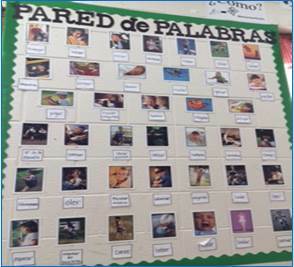 I have another style of word wall as well, that uses our curriculum specific words organized by Unit with with Clip Art pictures specific to the words. I made each Unit in a PowerPoint and printed out the slides in color and laminated them to use as the Word Wall. I like the Clip Art because it shows a very bright, clear picture. There’s a reason kids are drawn to cartoons, right? 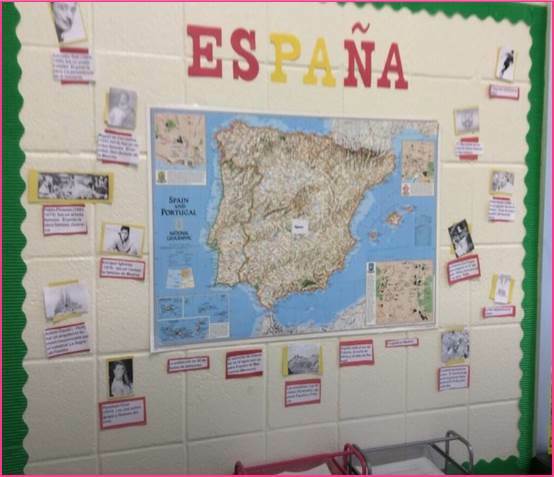 At the beginning of the year, before the students know any content, I use all pictures of culturally relevant places and maps for focus walls. I love using pictures of places I’ve actually been, because then I can tell them stories in down time moments about the pictures that they see all the time. They connect to the culture through me, and I’m able to make a distant place seem real. 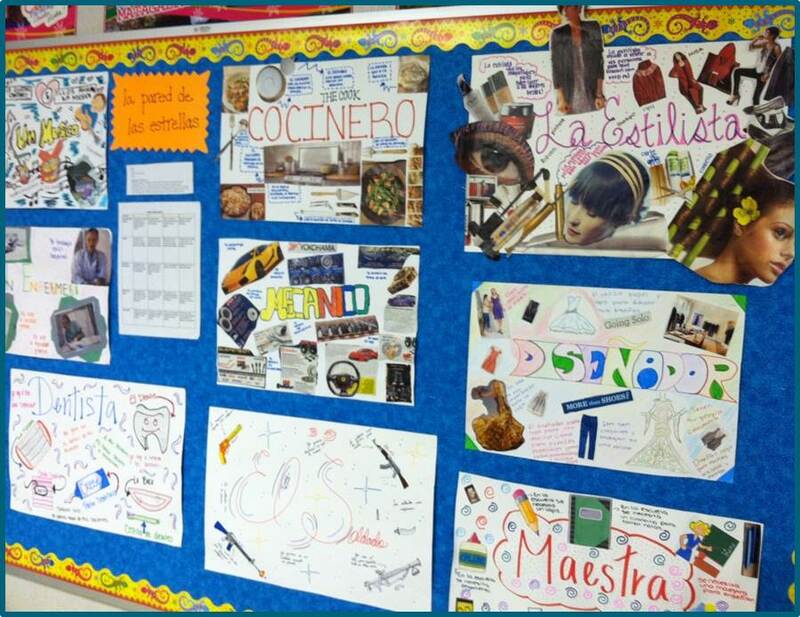 Once they start learning content, and they are able to do some things in the language, they become responsible for the culture walls and I switch things around a bit. I choose a country each unit, and give them free reign to investigate their interests in that country, using language that they know to explain what they discovered. They also have to print out a little picture to go with their discovery so that we can put it up on the wall. Student work is an important thing to have in your classroom. I mean, everyone loves to see their name in lights! Having work posted in the classroom, and in the halls if you’re allowed to, gives my students a sense of ownership and buy-in. They know that if they do well, I am going to show off what they are doing to anyone who steps into my classroom. Also, admin love to see proof I’m actually doing something, and they know they can tour people past my classroom to show off the language program. I make sure that when I put up work that it shows the best examples of what I asked for in the assignment. I keep a few lousy examples to show future classes what not to do, but I only post the high-quality work. When I post the work, I include the assignment description and the rubric I used for grading. That way, certain students can see why theirs isn’t up there, and the admin know what you were asking for. So…now that you’ve taken this whirlwind tour through my classroom, let me share one last thought with you. My goal with my kids is to empower them as learners, and equip them with the tools they need to grow their proficiency in the language. That’s it. That’s all I do. My classroom is a huge part of that effort because it invites them in, supports them in their learning process, and allows for us to reflect on their performance and celebrate their success. I believe that if they’re in a space where they feel welcomed and supported, they’ll go above and beyond in their efforts. I hope this has inspired you to get a little more obsessed with your own classroom. Even a minor change can have a major impact on what you get from your students. Let me know if I can help!